Filled artificial turf is influenced by the environment right from its very first day. Dust, pollen, plant debris and abrasive material are washed by rain into the fine cavities of the filling. The result of this process is a totally hardened surface, which is no longer water permeable. The covering becomes filled with particles of humus, creating the ideal breeding ground for algae, moss and bacteria. Artificial turf that is unclean is no longer fit for purpose and is at risk of causing accidents, as the surface becomes slippery. Only with regular maintenance and care, can a filled artificial surface be kept in optimum condition and remain playable for many years. 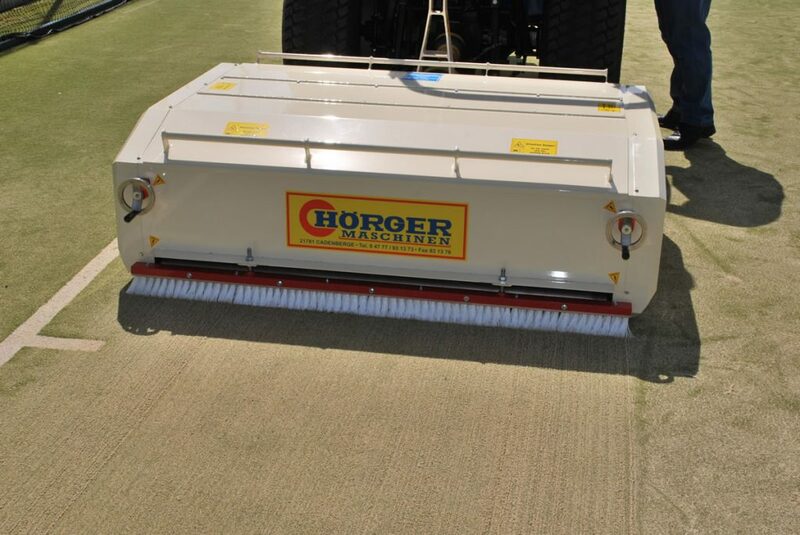 For effective upkeep, it is necessary to lift the filling material off the turf pile at regular intervals. Any coarse soiling is sieved and fine dust is filtered. The bent turf fibres are straightened, before the cleaned filling material is put back onto the surface for stabilization. 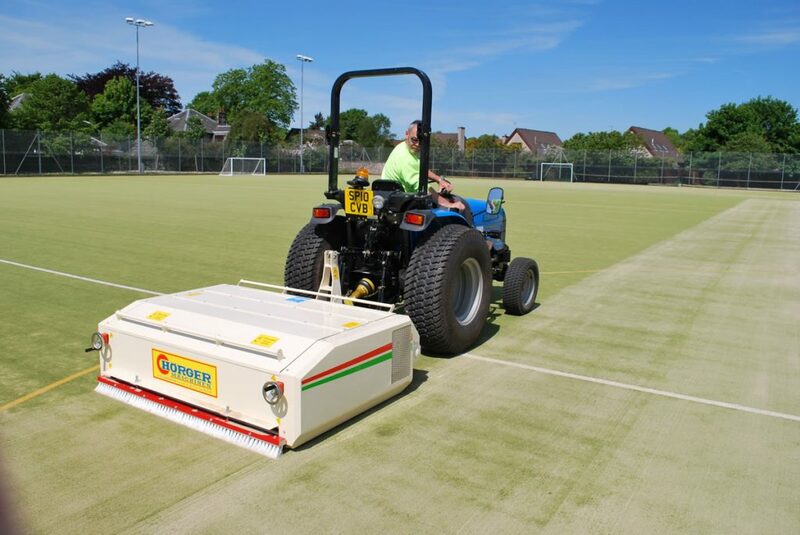 This cleaner has been developed as an assembly unit for compact tractors, making it a light footprint machine for use on sand or rubber filled synthetic turf. Intensive cleaning & loosening of the surface where the filling is loosened with the removal of plant debris and where drainage is being affected. Required once or twice a year, depending on contamination and usage. May require one or two passes to be effective. All the compaction is broken up and the infill loosened and brought back into the turf pile. Coarse soiling is removed and any fine particles responsible for the hardening are filtered. The artificial turf becomes loose & flexible again, drainage effect is repaired and the risk of accidents is decreased. This operation may require up to three passes with the turf cleaner, depending on the degree of contamination. 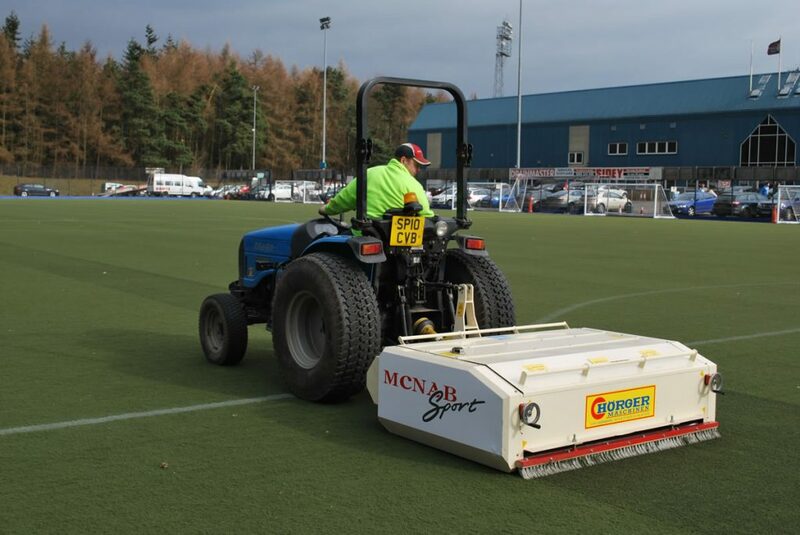 McNab Sport provides a service to calculate the percentage of contamination within the surface on 2G pitches. Samples are taken and laboratory tested. We can then determine the percentage of contamination and provide a written report on the maintenance required. We also carry out a moss/algae control service, along with seam repairs, sand spreading and full time maintenance contracts.